Pros: Such great results your smooth skin could be mistaken for being waxed, long lasting battery. Fantastic as both a wet or dry epilator. Cons: On the noisy side unfortunately and one of the higher priced epilators on the market. It is undeniably not great having loads of hairs around your body, what is even more upsetting is the fact that there are more companies and products around; full of promises on how they are going to help you get rid of that annoying hair! So far, the only remedy that has managed to deliver is the use of laser, which truthfully speaking is somewhat expensive to the majority, usually only available at professional salons, but laser hair removal is getting more and more accesible. However, there is something new in the market, well, not entirely new, given that the manufacturer is a well renowned company; Braun! The Braun Silk-epil 7 7681 epilator is yet another product promising to remove even the shortest and finest hairs, precisely up to 0.5mm long. 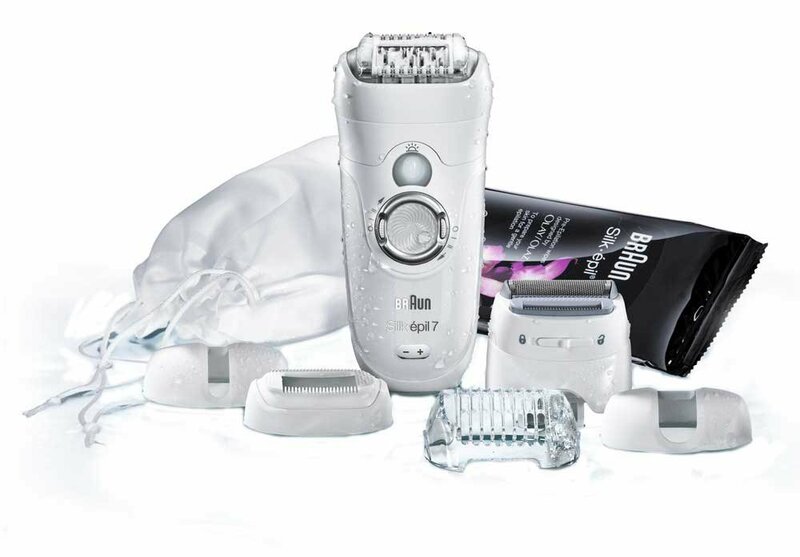 What is so special about Braun Silk-epil 7 7681 epilator? Braun Silk-epil 7 7681 epilator is a cordless electronic epilator, with capability of handling both dry and wet hair removal designed with features to enable it remove even the shortest and finest hairs. It’s pne of the pricier epilators on the market but hey, you get what you pay for nowadays and Braun have got there reputation fair and square! Shaver Head. The shaver head is an add-on that is capped on to the epilator to make it work like a normal shaver. Often this is used when trimming down long hair before going further to get finest details. Efficiency Cap. Designed to increase the contact between the epilator and the skin. When using this epilator, users are advised to always use this Cap for quick and effective results. Sensitive Area Cap. This cap is to be used on sensitive areas like the bikini line and underarms. In addition, it can also be used to control the amount of hair being removed. Facial Cap. This cap has a hole that is designed to help you accurately remove unwanted hair growing on the face. Enough with the caps I hear you say.. Does it work!? Braun Silk Epil 7 is perfectly designed into this state of the art shape that gives you full access to everything you want to remove! You can choose between three different colours; white, silver and a sparkly shimmer all meant to differentiate different functions. Additionally, it comes with a flashlight/smart light that is meant to illuminate the area being epilated, revealing any remaining hair that needs to be removed – ideal! So, getting down to the nitty gritty, the Braun Silk-Epil 7 7681 is an epilator that quite honestly works! There are plenty of caps to hit every area on your body you desire, making it a pretty useful tool in my opinion. The battery life is brilliant, don’t worry about charging before every session, every once in a while will do. Prefer a wet or dry shave? It can do both, so it’s down to whatever your heart desires, as we all know, a wet epilation can be a lot less painful than a dry one. Now, whilst I agree that this is a great epilator, as shown in our comparison table, it isn’t all going Braun’s way. Most epilators are quite noisy and the Silk-Epil 7 7681 is no different, there is no hiding what we’re upto ladies unfortunately. One more, she’s a little pricey. As I mentioned earlier you get what you pay for with most things in life and epilators are no different. Honestly, we are all different; there are people who find this epilator worth spending their money on while there are those who just can’t get on with it. The Braun Silk-Epil 7 7681 works brilliantly if your skin is not that sensitive and you have no problem with feeling a little bit of pain, which does ease. Fortunately, you can take advantage of the money back guarantee that Braun offer to try it out and see whether it works for you – that’s there confidence level though and it matches ours, this is a great epilator and pretty much the best you’re going to get on the market.